Readers of this blog know that I prefer multi-use clothing for travel. Each item has to work for multiple activities. It has to earn its place in my luggage or it stays at home. What surprises people is that I hold this same standard for my sleep wear. My pajamas, just like the rest of my clothes, need to work in a variety of situations. This keeps my carry on light and compact. Taking clothes that can only be used for sleeping is a waste of space. That’s why I don’t pack pajamas – I take clothing I can use as pajamas. My sleep wear choices change depending on the type of trip. They fall into several categories which I have outlined below. Sleep wear should be dual use to maximize your clothing. I like to take sleeping tees or t-shirt dresses for summer travel. These tees are usually made from a light modal or cotton weave. The material is thin and soft, making it a great choice for hot summer nights. The loose weave means that the garment usually doesn’t wrinkle. The tee dries quickly when laundered because it is so thin. The sleep tee above is by Gilligan & O’Malley (Target). It makes a great casual dress. Wear it with sandals on casual days. 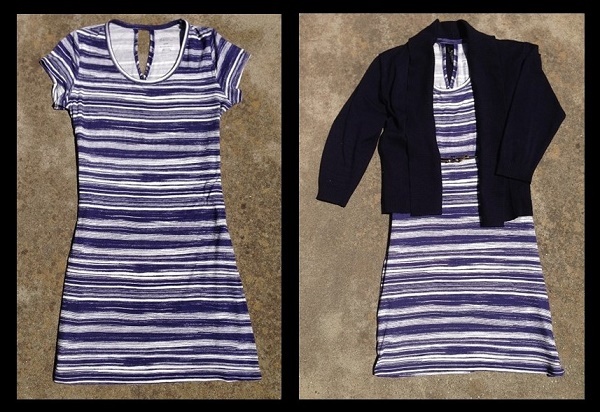 Dress it up with a belt, sweater/jacket, and cute shoes for a nicer look. The tee material is very thin so make sure you wear a slip under it. A light tee and leggings make a comfortable workout outfit. This outfit works best for multi-day hotel stays where you can launder daily. I work out in the morning and then head back to my room for a quick shower. I usually launder the tee and leggings when I’m showering, and hang them up over the bath. The performance materials dry quickly and are always dry by evening. The tee and leggings are nice for lounging at night. I usually add in a sweater and slipper socks if I’m working on my computer or watching TV. The “Noe” tee in the picture is from Royal Robbins. The sleeves adjust for 3-way styling – short sleeve, cap sleeve, or sleeveless. The tee has a rich color and a lovely drape. It looks great with a skirt or pants. I will pack a pair of light weight running flats in addition to the tee and leggings. I use the flats for working in the gym or running. I like the barefoot runners from Merrell. Most of the shoes are light and pack very small. 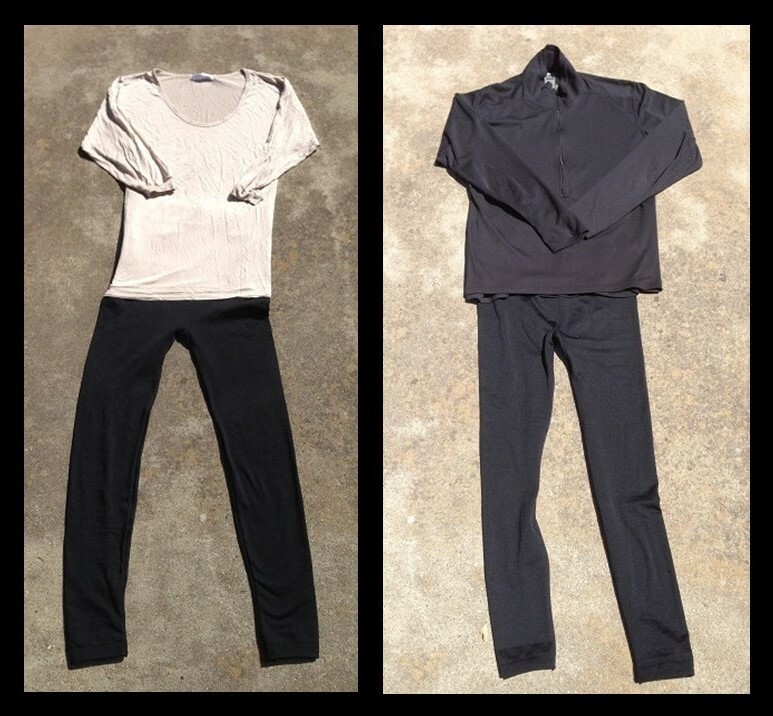 Base layers are a great sleep wear solution for transitional and winter weather. Base layers are great for sleeping or winter wear. They are usually very thin, taking up little space in the luggage. They have a great warmth to weight ratio. They dry quickly when laundered. In short, they are the perfect protection against unseasonal weather. I always pack my silk long underwear top just in case it rains or gets cold. The thin fabric works well as a layer of warmth under street clothes. 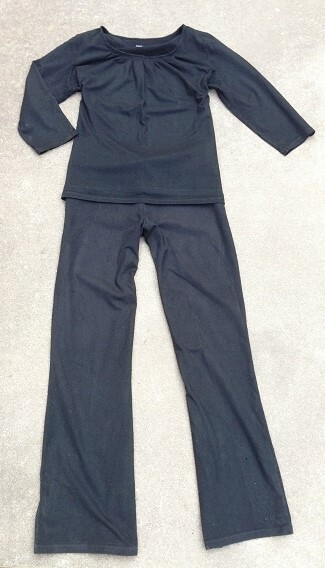 The top, when coupled with leggings, is very comfortable for sleeping. It provides extra warmth for hotel rooms that have too much air conditioning. When winter comes I take a t-zip shirt and fuzzy leggings. These work as a base layer for outdoors activities like skiing or hiking. They are also soft and warm for lounging and sleeping in cold rooms. I’ll add a fleece or sweater for extra warmth when needed. Yoga pants are always a favorite for travel. They provide the comfort of sweat pants with slightly more style. They have a looser cut, providing more modesty than leggings. Add in a loose fitting tee and you have a soft, comfortable outfit that provides the same coverage as street wear. This outfit is a great choice for co-ed situations when you want extra coverage. I like to wear it when lounging around with family during the winter time. Avoid cotton yoga pants as they dry slowly when wet. Find pants that are made out of performance material such as synthetic or wool. This lets them double as workout wear, and ensures that they will dry quickly when washed. A tunic makes a great sleep shirt or swim cover up. Belt it to wear with pants or skirts. A tunic makes a great sleep shirt or swim cover up. The loose cut is nice when the weather starts to get hot and humid. It is a perfect choice as resort wear. The tunic also works as a spare shirt under a sweater or dress. Wear it belted over a dress, pants or skirts. I like a longer tunic that I can wear with or without leggings for sleeping. Many of the clothing pieces above are part of my normal travel capsule wardrobe. In the summer I will usually pack a sleep tee, a silk long underwear shirt, and leggings. In the winter I will pack yoga pants and a base layer. Each item works by itself for sleeping or combined with other clothing pieces for a variety of activities. I’ll always have something clean for bed time since I can sleep in different outfits. Temperature changes aren’t a problem – just combine clothing as needed. I will add leggings and a fleece/sweater to the sleep tee when it gets cold. I may wear a base layer under the tee shirt and yoga pants when I’m staying in a cold bedroom. Layering the items provide plenty of temperature control with only a few pieces of clothing. Think about leaving your pajamas home the next time you travel. They really aren’t needed. Squeeze a little more function out of your capsule wardrobe by packing multi-use clothing you can sleep in. You’ll enjoy the space and weight savings! Good sleep means a great time the next day! Great advise, wonderful blog. You may also want to check out an ECO friendly fashion line from Bali. Goddess on the Go/net. 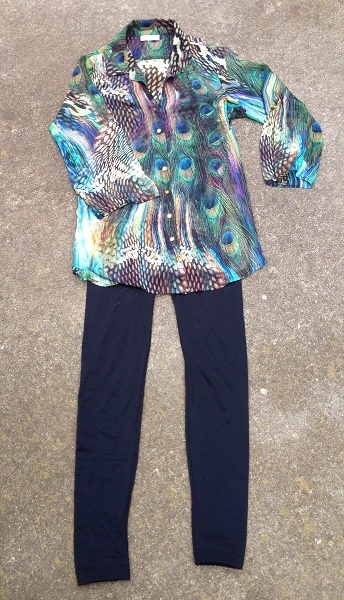 One outfit, I sleep in, yoga , gym, add silk scarf for lunch, jewels for Dinner . 14 colours, xs- xxxl. Worth a look. GoG has many lovely pieces of clothing! I’m a big fan of modal. It’s a great material for hot and humid environments. I also notice that they listed the weight of the clothing collections. That shows that they have an understanding of the light traveler. Oh, they look so comfortable! I actually didn’t think much about the sleep wear when packing, I concentrate mostly on the outfits during the days, so thanks for heading me this way, Cindy! What a great idea! My wife either forgets to pack sleepwear or it doesn’t fit in her carry on. I will pass this on to her. Thanks for sharing!